The select caspar speed was introduced in 2009 and after many hours on the water I think its time to write a online review. The fin is based on Caspar Verhaagen his custom (still the favorite fin of many pro's in the Netherlands). Supersafe, it will not fail on you strong gusts, windgaps, breaking at high speed. The fin does never spin-out. Difference is very small with original, still I saw some worse finish production fins. However in 2010 all new select models will be hand finished, maybe all bad finish problems will be over from now on. With the 2009 model you have to pass the fin if: little holes in leading edge or thick trailing edge. The select caspar speed is the most allround speedfin I know. This fin was competitive in any condition we had in 2009. My conclusion was there should be better fins for specific conditions... This is my current quest! Find fins that are very good in a small range, peak performance is needed for a world speedrecord game... Maybe I am wrong, in 3 years we hope to know the ins and outs of peak performance. Erik is windsurfer for 10+ years. In his daily life he is professional in construction dewatering, advisor, troubleshooter. Erik likes adventures, explore and to challenge himself. During his life he is trying to get the best out of it and have respect for the earth, nature and future generations. The modern world is about sharing, in this blog Erik shares his experiences, selfreflection and lessons learned. 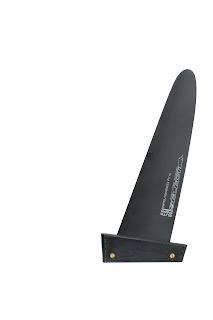 I think this fin is really the speedfin for the average gps-speeder. You can't do anything wrong with this fin and it will deliver enough performance for the average gps-users. I am searching for the best speedfin for flatwater cond like Karpathos. I will use the fin with F2 Missile I(50cm/66L) and Vapor 5-5.5. Based on your reviews the Select Caspar looks like a very good candidate beacuse of good allround performance and safety. What finlength (25-27cm)would you recommend for this board/sail combo (Wind 35-45kn)? My main goal is to break 40kn topspeed (PB=38kn Manta59/Vapor5.5)so it is important with maximum acceleration, because Karpathos has a limited area of flatwater before the chop start, but resistance against spinout is also important. Forgot one question. Is there much difference between standard and Elite version in this size, and what are the differences.I plan to buy standard version. Excellent blog, by the way. The F2 missile 1 is not 100% pure speedshape, that is what I remember. The advantage of the Missile 1 is you can surf with more ease in difficult conditions, sometimes faster than a 100% pure speedboard like the missile XS. I would for 90% of all conditions recommend the 27cm. Only in really strong gusts or wind the 25cm will be faster on flatter water. Spinout resistance is SUPERB with select caspar speed. @Bård: the pro- and elite serie, the biggest difference is finish. I prefer elite, but to be honest did my highest speed with a proserie (40kn 10sec runs). I recommend 2010 because it is the ELITE version for the PRO price!?! The finish of my pro series caspars was perfect. I use 27 and 23 cm in a CA44-like Customboard and I already had a spinout at the very choppy end of the course. In non-perfect conditions I felt much more confortable with the Lessacher Rake30. I can use a 23cm Rake30 even with 6.8, so its less dangerous to sail in shallow waters, plus it handles weed better than the Caspar and the tip is less sensitive to ground contact. Ok, I will go for a 27cm then. It will give me better range especially in small chop and probably not limit top speed compared to the 25cm, allthough I'm sure the 25 would be nice when its blowing 40+ in Karpathos . Another benefit is I can use it with a 6m+ sails. Thanx for the info, guys. I bought 3 Select Caspars 2010. They have a very good finish, even when I look at them with an steel rule. However, the trailing edge doesn't seem to be very sharp. Do you think it is necessary to sand the trailing edge for good speeds, ore is it, being an Elite, OK? I have seen the 2010 Select Caspar (Johnny Tuijn rides the new 29cm). It was in great shape and both leading and trailing edge was sharp. The trailing edge can sometimes be not supersharp, the effect will be noticed when you want to ride superefficient. I solved this by carefully sand the trailingedge with sandingpaper glued to something flat. However the elite 2010 caspar I have seen did the job quite good. It was faster than me the first day ;P, or maybe Johnny himself was just faster that day. Ride fast and have fun! "Empowering small business owners to build a sustainable lifestyle"
[review] Starboard Hypersonic, hype or true? About "my adventure GPS surfingblog"